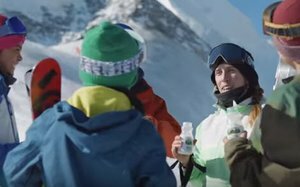 Gold Medalist Maddie Bowman’s awesome freestyle skiing skills are on display in two new TV spots for Milk Life’s 2018 Winter Olympics campaign. This is the second Team USA outing for Milk Life — the tagline for The Milk Processor Education Program’s umbrella marketing campaign since 2014 (when it replaced “Got Milk?”). In the main national TV ad (30-second version below), Bowman’s mom is heard in a phone message, reminding her daughter that she’s been on skis longer than she can even remember, and that everything she needs to succeed is already insider her. Home movies of Bowman skiing as a child, along with current-day action footage, back the conversation. The ad — also in a 15-second TV version and a 60-second digital version in which Bowman admits to mom that she’s having some last-minute nerves — is a continuation of the concept behind Milk Life’s 2016 Summer Olympic Games TV spot featuring swimmer Caitlyn Leverenz, in which Leverenz is inspired by notes from her mother. The ad debuted this week, and will continue airing on NBC local affiliates during Olympic programming and beyond. Bowman’s second ad is an extension of Milk Life’s kid-focused “Milk It!” campaign. Called "Maddie's Biggest Fans," it features Bowman skiing alongside exceptional kid skiers who aspire to reaching her level one day. The spot complements "Milk It!" skateboarding and soccer TV ads already in market that target nine- to 10-year-olds. The kids’ campaign “shows how there’s a champion inside everyone — ‘All you gotta do is Milk it!,’” says Miranda Abney, MilkPEP’s senior director of marketing. The kids’ ad will air nationally on cable networks including Disney, Cartoon Network and Nickelodeon, as well as online. As with Milk Life’s campaign for its first-time Team USA sponsorship at the 2016 Summer Olympic Games, MilkPEP’s longtime agency of record, Campbell Ewald, is leading both creative and media for the 2018 campaign. Also as in 2016, the new campaign involves integrated national and local components. Milk Life’s “Team Milk” roster also features 30 other elite U.S. athletes, including Kristi Yamaguchi, Rico Roman, Joss Christensen and Jamie Anderson, as well as Olympians and hopefuls who will work with milk brands and councils in their own hometowns. The local efforts will include digital and in-store advertising to run through the 2018 Games. Milk Life’s sponsorship of the U.S. Olympic and Paralympic teams extends beyond the 2018 PyeongChang Games, to Tokyo 2020.